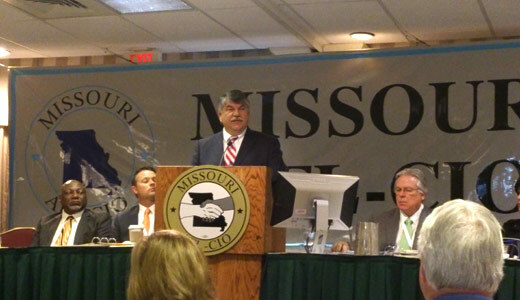 ST. LOUIS – “We meet here at a critical time for Missouri, the nation, and the labor movement,” Richard Trumka, president of the nation’s largest labor federation, told nearly 250 delegates and guests at the Missouri AFL-CIO 27th Biennial Convention held here September 14-17. Early in his keynote, Trumka turned his attention to the recent killing of Michael Brown, an African American youth shot to death in Ferguson, Mo., by a white police officer. His comments, brimming with both anger and optimism, cast a self-critical eye on labor’s history. Trumka’s remarks come after weeks of marches, protests and peaceful civil disobedience in Ferguson – all of which was initially met by riot police, pepper spray, percussion grenades and rubber bullets, a misuse and abuse of police authority that has served to galvanize this largely African American, working-class north St. Louis County community and the nation around issues of police brutality, racial profiling and militarization. Ferguson police officer, Darren Wilson, shot and killed Mike Brown on August 9. Brown’s family, attorneys and eye witnesses say Brown was shot as he attempted to surrender with his hands up. Trumka continued by highlighting the ongoing, systemic nature of police brutality and racial profiling, and warned that the killing of Brown was not an isolated event. “Our brother killed our sister’s son and we do not have to wait for the judgment of prosecutors or courts to tell us how terrible this is,” Trumka added. “How can we not be involved?” he asked again. “Lesley McSpadden, Michael Brown’s mother, who works in a grocery store, is our sister, an AFL-CIO union member. And Darren Wilson, the officer who killed Michael Brown is a union member too, and he is our brother,” Trumka continued. “We can’t wash our hands of the issues raised by Michael Brown’s death. We need to clearly, openly discuss the reality of racism in America,” Trumka told the black and white, young and old, male and female, gay and straight gathering of union leaders. 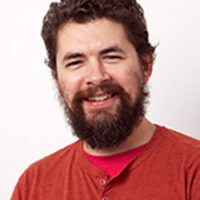 He challenged union leaders to imagine the fear parents of color feel when they “wonder, with good reason,” if this will be the last time they will see their child alive. 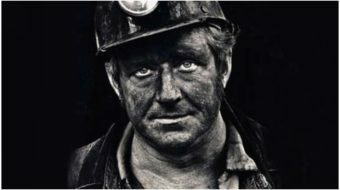 But it “doesn’t stop there,” the former mine worker added. The AFL-CIO president also addressed the “runaway inequality and desperation among staggering wealth” many workers face today due to stagnating wages, unemployment, and an all-out attack on pensions, healthcare benefits and other hard-won gains. He said these attacks have been spearheaded by “far right-wing” politicians and corporate CEOs. “Justice and fairness just don’t happen. We have to make it happen. We have to build power. We have to take this country back for every last worker out there,” Trumka continued. He reminded the audience, “Corporate bosses will play the race card over and over again,” all in an attempt to “break the union” and “dash the hopes” of ordinary working families. Louis said the Missouri State Federation was committed to sending people to Ferguson, to help facilitate apprenticeship training, to do voter registration, and to help community members get to the polls in the upcoming November elections. A new voter registration drive is currently underway in Ferguson, as community leaders begin to tackle many of the other political issues brought to the fore out of the Mike Brown shooting.